It is with great pleasure that we can announce the release of Ian C Douglas‘ third book in his young teen science fiction Zeke Hailey series, The Particle Beast. The Kindle edition is out now, and the print edition will be released in all good online bookstores on 1 June 2017. In the meantime, you can order print copies now direct from us. They say the truth can set you free. Yet on Mars the truth can kill. Zeke Hailey is happy enough at the Chasm, the 23rd century school for psychics. But an answer to a secret throws his life into chaos. Now Zeke must choose between his friends and his missing father. Mars, however, isn’t ready to let him go. World famous translator Dr. Enki arrives with a sinister plan and he needs Zeke’s ability to speak Martian to help him uncover an ancient Martian city. A hideous monster lurks in this alien ghost town, with the terrifying power to erase atoms. A creature so deadly, it must never get free. But more dangers are waiting for him inside than just the monster. Zeke must find a way to defeat his greatest enemy before the fabric of time and space unravels forever. In coming days IFWG Publishing Australia will be releasing the third instalment of the Zeke Hailey young teen science fiction series, The Particle Beast, by Nottingham-based author Ian C. Douglas. The cover beautifully reflects a critical scene in the novel, artwork rendered by Catherine Archer-Wills, and designed by Elizabeth Lang. Keep a close eye on our site – it should be released in several days. Kindle book buyers will now see Ian C Douglas‘ Zeke Hailey series bundle on their sites at a special price for the first two books. IFWG Publishing Australia will release the third, much-anticipated instalment in Q1 2017. For young teenagers, or those who are young at heart, you will not be disappointed in this science fiction adventure series! On Mars, your best friend sometimes turns out to be your worst enemy. Zeke Hailey is struggling with life at the Chasm, the 23rd century school for psychics. His extrasensory skills have dried up and there’s a prehistoric robot out to kill him. At least he has a new mate, in the shape of late comer Fitch Crawley. Only there’s more to Fitch than Zeke realises. The boy has a genius for hypnosis, making fools of the teachers. Fitch has an invisible pet too, a creature armed with deadly venom. Zeke and Fitch team up with an old foe, setting off on a Martian road trip. But this search for answers will bring them face to face with monsters and, most dangerous of all, a demon from beyond time. Zeke will have to do more than survive his mind-bending friend and the ancient killer robot. As the universe starts to collapse, Zeke must choose between saving his friends or the human race. For nobody but Zeke can stop the apocalypse of Gravity’s Eye. 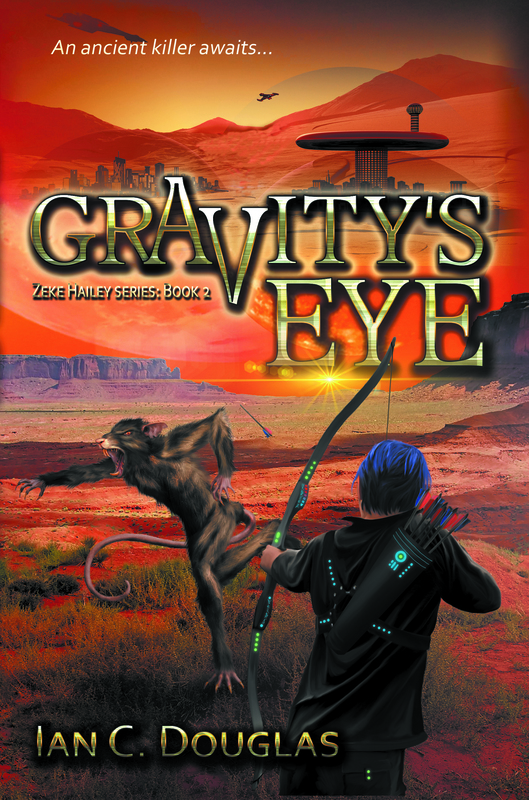 It is with great pleasure that we announce the release of Gravity’s Eye by Ian C. Douglas, the second book in the Zeke Hailey young teen science fiction series. The first book, The Infinity Trap, had been received very well, particularly in the UK, and we look forward to similar reactions with this exciting sequel. Special mention should also be given to EL Designs for cover design and much of the artwork, and Catherine Archer-Wills for action art. Gravity’s Eye is now available in Kindle format, and will shortly be available in trade paperback in all good online stores, and direct from IFWG Publishing Australia.